This inaugural Strungmann Forum Report explores the human ability to make decisions, consciously as well as without conscious control. 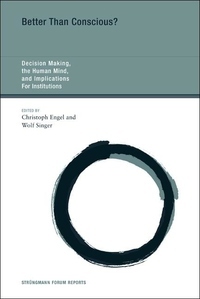 It explores decision-making strategies, including deliberate and intuitive; explicit and implicit; processing information serially and in parallel, with a general-purpose apparatus, or with task-specific neural subsystems. The analysis is at four levels -- neural, psychological, evolutionary, and institutional -- and the discussion is extended to the definition of social problems and the design of better institutional interventions. The results presented differ greatly from what could be expected under standard rational choice theory and deviate even more from the alternate behavioral view of institutions. New challenges emerge (for example, the issue of free will) and some purported social problems almost disappear if one adopts a more adequate model of human decision making.